Estimates of changes in upper ocean temperature, heat content, and sea level are dependent on the coverage of subsurface observations in space and time. Historically, these data are sparse, which has limited our understanding of ocean climate variability and change mechanisms. Ocean state estimates, which effectively represent a model synthesis and integration of the available observations, including internal observations in the ocean and surface forcing, help to address the inhomogeneity of sparse observations in space and time. Here we evaluate the representativeness of ocean state estimates from the Simple Ocean Data Assimilation Version 2.2.4 (SODA) data for studying Indo-Pacific Ocean decadal temperature and sea level variability over the period 1950�07. The SODA data are evaluated against independent sea level anomalies from long-record tide gauges at Midway Island and Fremantle, reconstructed sea surface height anomalies, and sea surface height anomalies from TOPEX/Poseidon satellite altimeter observations at the decadal time scale. This study demonstrates that SODA captures the characteristic Interdecadal Pacific Oscillation (IPO) over the upper 200 m, and accurately represents these decadal changes against the independent observations. The SODA-product shows a meridional asymmetry of patterns that connect the western tropical Pacific and the Indian Ocean, apparently in relation to IPO changes. Regional sea level at the Midway Island and Fremantle tide gauges confirm this decadal connection and the relationship with the IPO. 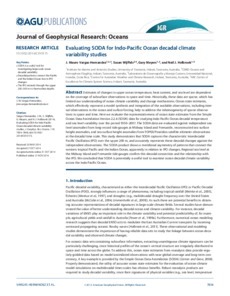 We concluded that SODA is potentially a useful tool to examine ocean decadal climate variability across the Indo-Pacific Ocean.